Verity Abel of Staples High School in the 500 free-style event during the FCIAC girls swimming championships at Greenwich High School, Saturday afternoon, Nov. 5, 2011. But for athletes like Staples High's standout swimmer Verity Abel, who is tirelessly dedicated to her sport, they certainly are rewarding. Abel abides by a strict practice routine--one that she admits is taxing on the body--and has built one of the most impressive resumes that the school's swim program has seen. 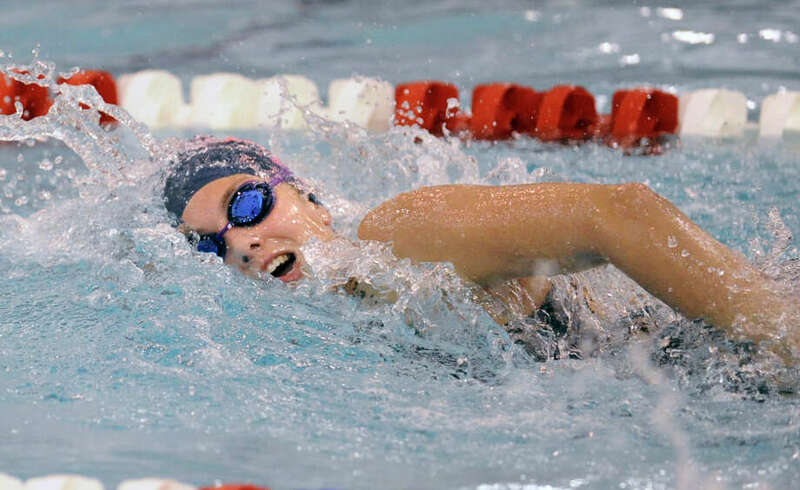 She's fresh off a clean sweep statewide in the 500-yard freestyle, taking titles comfortably at the FCIAC, Class LL and State Open meets this fall, and finished a place shy of duplicating that feat in the 200-yard freestyle. "It's a really, really tiring sport," Abel said. "The level of commitment is insane. There's other exercises that you have do that are supplementary to the swimming, such as weightlifting and dry-land exercises. It's not just the pool time." Just a junior, Abel's accomplishments and her makeup as an athlete, from the talent she possesses to her work ethic, have drawn her plenty of lofty comparisons from her coach. Mike Laux, who is in his 15th season with Staples, ranks Abel on the same level as Division-I swimmers who have come through the program, including Molly Hennessy (Northwestern), Molly Loftus (Tennessee) and Emily Fenn (Michigan). "It's about motivation and hard work. If you have those things then you're doing good," Laux said. "Verity is motivated and she works hard, as did Molly Hennessy, Molly Loftus and Emily Fenn. They all had that same motivation." Abel's passion for the sport is unwavering and her commitment to a practice regimen is sincere. She devotes six days a week to workouts and believes that anything less would be detrimental to her progress. "If you take time off, then you get out of shape really quickly," she said. "It's kind of tricky to take a break from it and then return." Abel's junior season at Staples concluded on Nov. 17 at the Open, where she breezed to the 500 free title in 4:58.47--more than eight seconds ahead of the next finisher. In the 200 free, she clocked in at 1:52.24, which put her a close second behind Jessica Hespeler of Ledyard (1:50.75). Both finishes capped Abel's strongest postseason yet and the 16-year-old phenom will soon have a chance to add to her ledger. The break before the next competition is a brief one for Abel, who will jump into the heat of her season with her club team, the Wilton Y Wahoos. On Dec. 6, Abel and her club teammate, Brookfield High's Maddie Smart, will race against some of the top swimmers age 18-and-under in the country at the Junior Nationals in Knoxville, Tenn. Abel will compete in a pair of distance events, the 1,000 yard and mile, according to her coach Randy Erlenbach. "For me and my swimming career, this is the highest meet that I've qualified for," Abel said. "I'm really excited to go and compete there." Abel won the mile event at the Y Nationals last July in Atlanta with a time of 17:04.29. She finished just over four seconds off the Y national record and calls the win "one of the most thrilling moments I've ever had." "That was really the highlight of my summer," she said. Abel's run of success carried into the high school season this fall when she won both the 200 (1:52.54) and the 500 (5:00.46) free at the FCIAC championships on Nov. 7. She again took first in both events at the LL championships just seven days later, setting a LL record time of 1.51.88 in the 200 free. "I was really thrilled with how this season went. I was happy with my own personal swims and I was also really happy with how the team did as a whole," said Abel, as Staples placed sixth in the FCIAC this year. Both of Abel's coaches have seen her make steady progress as a distance swimmer and speak glowingly of her potential. As a freshman at Staples in 2010, Abel competed primarily in the 100-yard butterfly and 100-yard backstroke, and showed glimpses of being something special, posting a record time (57.61) in the backstroke at the LL finals that year. "Verity came in with tremendous potential," Laux recalled. "She could swim anything. It was just a matter of where she wanted to put her efforts." Abel also competed in the 200 yard individual medley early in her time at Staples, but shifted over to distance events, believing that she had the endurance and technique to succeed. "It wasn't really my decision. It was just through training and through competing, I realized that I had the endurance to swim in longer events like freestyle," Abel said. "I just worked on it every day at practice. ... That produced what I am now, which is a distance freestyler." By swimming seemingly around the clock, Abel has made the shift over to the distance events a smooth one. Outside of a small window of rest in April between the winter and summer club seasons, Abel plans to stay busy with her training. "She's good at those two events because she works hard, she trains hard and she's able to maintain her pace," Laux said. "She doesn't have blazing speed, but she had lots of desire and lots of endurance. That's what you need for those longer races." So far, those abilities have carried Abel a long, long way. "She's got an engine. She is built to be a very good distance swimmer," said Erlenbach, who has coached Abel for close to two years. "She's not real tall or anything like that. ... Her technique is great, she works hard, she has unlimited potential, which we are trying to scratch the surface of by training really hard."